I know, you immediately think of dry tasteless burgers. I used to make the one from Mira Lago that Oprah spoke of, but Christina doesn't like any fruit in her food. 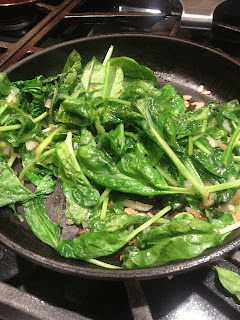 This recipe from Sara Moulton was published in our paper, and I cut it out. When I lost it I went to the online archives and couldn't find it. So thankfully other papers ran the same AP story. 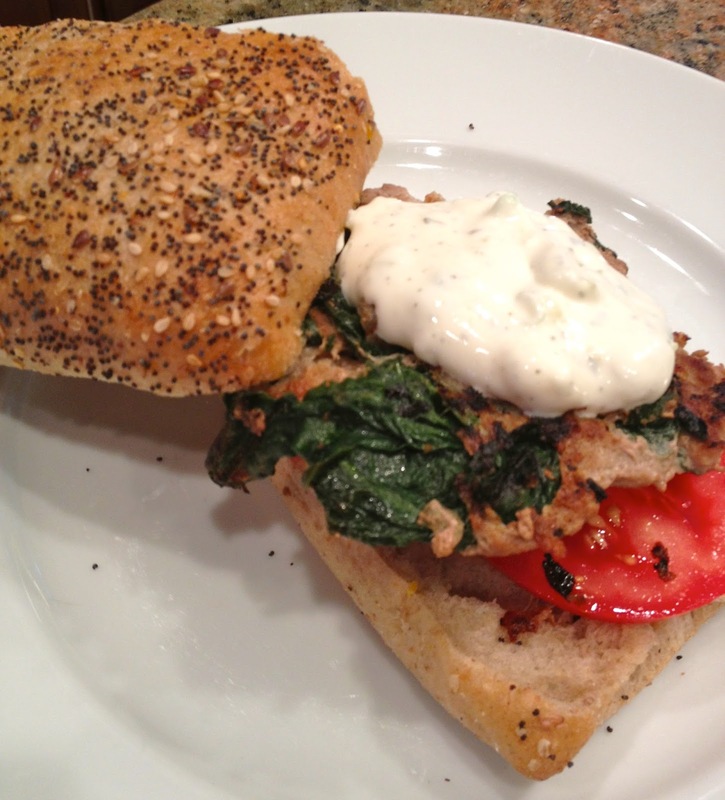 There is nothing earth shattering about this recipe, but I am going to tell you we love these burgers. We really, really, love the sauce. Of course, I can never leave well enough alone, so I did make a few changes. The first was to double (or more) the recipe. I have a hamburger press and hamburger papers so I make a dozen or so and freeze them between the squares of wax paper. Christina and I could chip one off the stack and cook it up at a moment's notice. I haven't tried them on the grill, turkey generally falls apart there, so I just pan fry in a little coconut oil. And the sauce. The delicious sauce. Skip the ketchup, mustard and mayonnaise. This sauce is blissful. Not a tzatziki per se, but similar. Yet so different. We sometimes skip the bun (not Mr. Preppy) and the feta on the burger, and I don't miss either one. Here is my version, the original can be found here, in the Santa Cruz Paper. the largest bag of spinach available (at least 10 ounces) The more greens, the healthier! 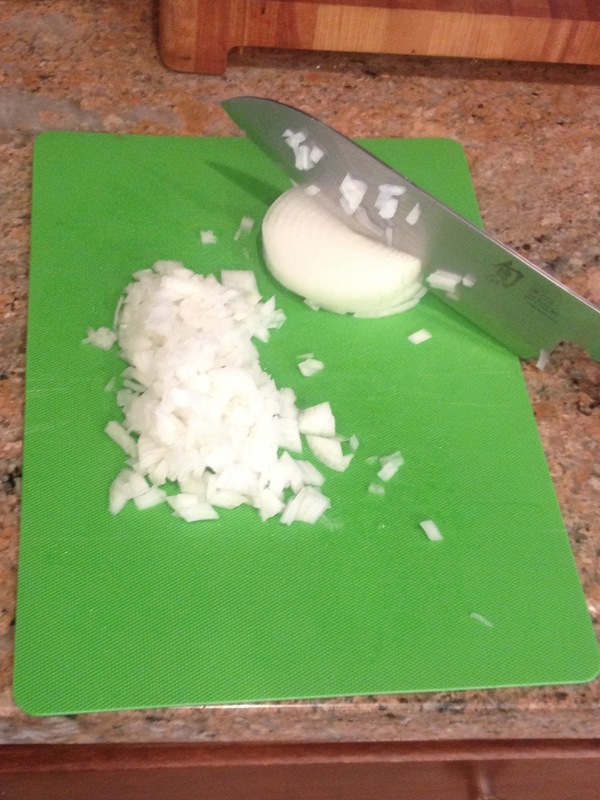 Saute the onion in coconut oil until translucent. Add garlic and quickly cook without burning. 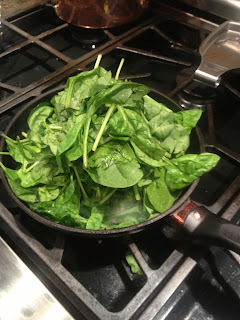 Add spinach in batches, adding more as it wilts and sprinkling S&P and Cavender's. Cover with lid to speed up wilting, and stir to mix all ingredients. 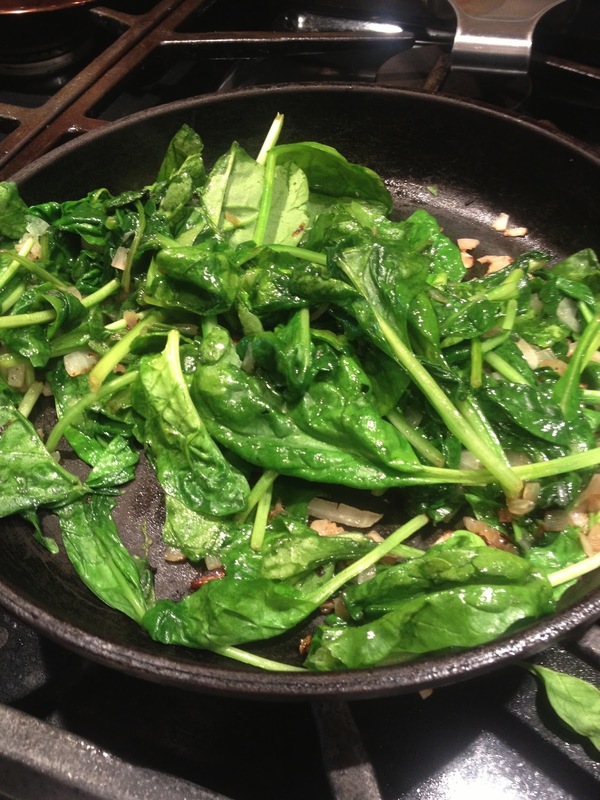 I have been known to add kale, arugula or any other green wilting away in my produce drawer. Red peppers? Mushrooms? Why not!! Take off the heat and let it cool. Mix all ingredients in a bowl, and cover and chill. It gets better in an hour or so. We love the pepperoncini so we add a lot, it is your preference. You can certainly up the mayo, or use regular mayo and add more lemon juice. I've added kalamata olives to it, fresh parsley, pimientos even green onions. All I can say is make extra. We dip cucumbers in it, crackers, spread it on a turkey sandwich and eat it off a spoon. It's that good. When your veggies are room temp, mix them with the turkey in a bowl so they are all distributed. The spinach will be stringy and that's ok. Patty your burgers and either cook immediately or freeze for later. 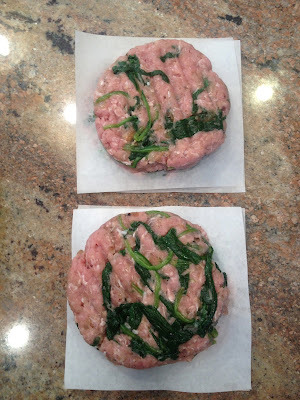 I saute the burgers in a pan, stovetop, in a little coconut oil. Cook on a medium low so the outsides don't overcook before the insides are done. Serve with the amazing sauce, with or without a bun and Feta. Open a chilled white and invite me over for dinner! What are you waiting for? Get in there and cook! Hot summer days make me not want to cook dinner. I mean nothing. 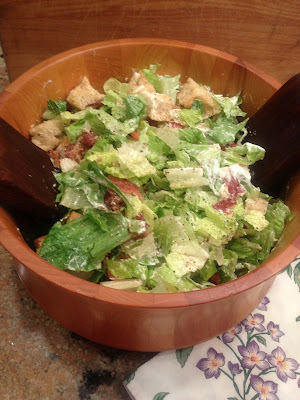 Thankfully, I found this recipe for a BLT Salad as a part of a cooking class I taught. The theme was Summer Entertaining, and this salad had us all swooning. The recipe is adapted from Williams-Sonoma Cooking Together, by Erin & Tatum Quon. It is fantastic. Recently the guys had Poker Night with beer and dips, and I made my BBQ Chicken Dip for Mr. Preppy to take. The girls had salads and wine and a new game (no Bunco in the summer), Telestrations. Which is perfect for a group of 8. It's like Pictionary and telephone. The best part is you can carry on conversations while playing, an important fact when 8+ women are together. 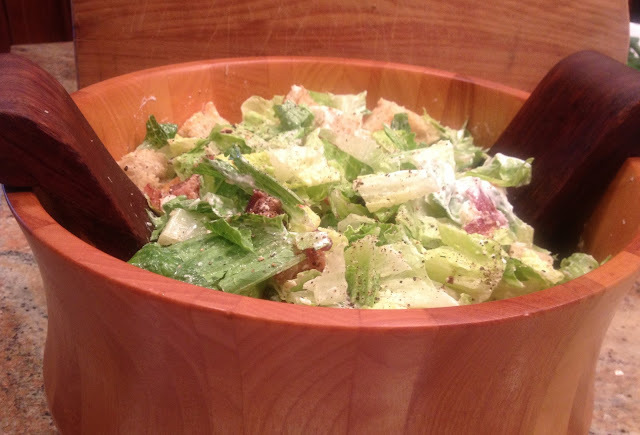 I made the salad with Greek Yogurt instead of sour cream for the ladies, and they loved it. It is fantastic as written though. I love a recipe that allows you to add and subtract based on your tastes and your diners. I made it for dinner one night and cooked more bacon, as that was all Mr. Preppy was getting for dinner. He has asked for it again, and again. You can change out the bread if you like, whole grain, sour dough, whatever. I especially love it with chunks of avocado. No rules. Cook the bacon either stove top or oven, which ever method you prefer. Drain and pat the grease off. Spread the bread on baking sheet and drizzle with oil. Toss to coat. I also toss a little of the bacon grease on there. It gives bacon essence to the croutons. Bake at 400˚ for about 10 minutes, until browned and crispy. In a blender, mix the sour cream. lemon juice, Parmesan, salt and garlic. Puree until smooth. Adjust the seasoning if desired. In a large bowl, toss the lettuce, croutons and tomatoes with the bacon and dressing to coat. Serve immediately. So, what are you waiting for? Get in there and cook! Yep, you read that right. The Hobbit. I am going to make my confession right up front, I am not a true fan. Wait, I loved the movie, I watched it numerous times. I was really surprised at the humor and the story. I never read the book. I know, I know. I have never seen Lord of the Rings. But I want to, I really do. I watch movies when I am in the kitchen cooking and baking, and the Lord requires my attention. So I am waiting for a cold rainy day, and I am going to do a marathon. So I am a fan, I'm just not one of those fans. You know who you are, and I admire your passion to the story, the details and the history. I think it is all fascinating. I just was never introduced to Tolkien in high school. So why Hobbit cookies, you ask? I have an amazingly talented sister who is working on the Hobbit DVD. Yep, I know. It is so cool. All her jobs have been cool. She worked on 5th Ave in NYC, she was a stunt woman on Rescue 911, she was a producer for World's Wildest Police Videos, she met her uber-talented husband on the set of The Babe, she was stunt and he was camera operator. She has produced a few pilots that went no where, and produced an ESPN show on the best high school basketball players. And now, she works on the Hobbit. So she wanted cookies for a birthday and I said yes! Thankfully there is an amazing cookier that I found over a year ago. Mike at SemiSweetDesigns. Talk about talent. He designs aircraft engines or something super technical at Boeing and decorates cookies. Not like I decorate cookies. This is an artist who found a bag of royal icing, and creates edible art. Last summer he posted a tutorial on the Hobbit Door Cookies, in anticipation of the movie release. When Lori started working for the Hobbit I knew those cookies would come in handy. Did they ever. I also emailed Mike and he was so nice about answering my crazy Hobbit questions. So here is my collection. The key, which is an important part of the movie. The sword of course. And the Hobbit door, which Mike and Lori suggested I put the Rune on, and I did. As I watched the movie I was very focused on the door, and fell in love with the interior of that door. The scrolled iron work was gorgeous, I want that door. And of course I had to put my favorite Tolkien saying on a cookie, Not all who wander, are lost. Profound, really. And lastly I wrote Happy Birthday in Elvish. I found a Hobbit Rune Generator. Now as I said, I am very new to this. I had my choice of 3 different Runes, and I chose Elvish Tengwar like Gandolf uses at the end of the Third Age. I have no idea what I just said, but the lettering was so pretty...I chose that one! Honestly, about the most fun I have ever had making cookies. I know my sister is so excited to get them, and she will shower me with same flattery I used on her. We're good like that. She is the business, I am the creative. We are a great team. So, I am so excited for the next movie. Really. I have midnight showing plans for sure. And cookies will follow, no doubt! So what are you waiting for? Get in there and create!! !